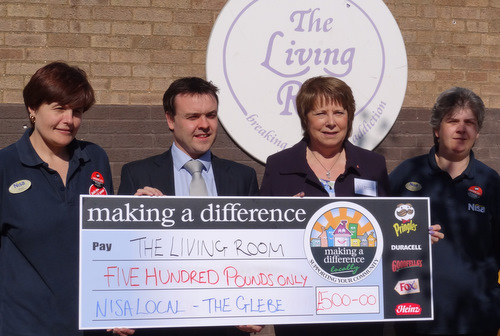 Stephen McPartland MP joined at The Glebe, Chells as employees of the Nisa Local presented a cheque for £500 to The Living Room. The money was raised for the drug addiction and therapy support group. It will be used towards transport costs of trips out for children of those assisted by the charity. The cheque was received by Janis Feely, MBE, founder and project director of The Living Room. Stevenage MP Stephen McPartland was brought in by Michael Hearn, local councillor for Martins Wood, to help with a long-standing problem in Foxfield with the one-way restrictions being ignored by many drivers. Stephen said, "I have raised the situation with Hertfordshire highways and they have agreed to place some straight ahead road marking arrows on the road to remind people it is a one way street. I will also ask them if they can look at some additional measures I discussed with the residents." Foxfield residents met with Stephen and Michael to raise their concerns, commenting, "As well as cars, you often see delivery vans going the wrong way and even vehicles used by various local public services. Foxfield has been one-way for 20 years, but people are ignoring the signs more and more. It is an accident waiting to happen." Stevenage MP Stephen McPartland joined police officers on patrol across Stevenage on Thursday night. Stephen said: “I wanted to go out on patrol with police in Stevenage to reassure residents that our town is safe. The arson attacks in Bedwell did increase fear in the area but they were not linked to the national disorder we have seen in London - those rioters are nothing more than pathetic thugs engaged in criminal activity. There are no excuses for their behaviour. It is disgraceful that they feel it is okay to steal or destroy other people's property and this will not be tolerated in Hertfordshire. Stephen added, "The police have a vast array of resources available to them and the officers I was with on Thursday night were very professional and committed. I am very impressed with their determination to keep Stevenage safe for local residents and I certainly felt reassured seeing them in action." Stephen McPartland Member of Parliament for Stevenage commented, "I know the arson attacks place fear in the Bedwell area but we would like to once again reassure people that what happened in Bedwell is not the same as what’s happened in London and other cities. In those cases there have been groups of 300 to 400 people but here it was a small number of people." Stevenage MP Brands Rioters "Pathetic Thugs"
Stephen McPartland, Member of Parliament for Stevenage, spoke today about the riots in London. He said, "These riots are nothing more than a number of outbreaks of criminal activity by a bunch of pathetic thugs. The scenes on TV are truly shocking and I am disgusted that these hooligans feel it is ok to destroy and steal other people's property." Stephen reassured local people by saying, "I know many people have been frightened by this outbreak of violence and I would like to reassure them that no such incidents are taking place in our communities locally. Hertfordshire Police are helping in London and have a vast array of resources available if any copycat incidents were to take place locally. I fully support the work of Hertfordshire Police and stand ready to request any assistance they would need from the Home Secretary". 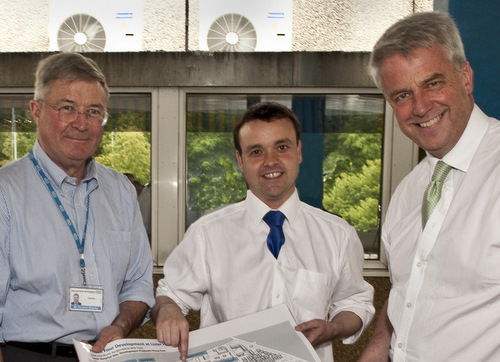 Stephen McPartland, Member of Parliament for Stevenage, was pleased to welcome Rt Hon Andrew Lansley, CBE MP, Secretary of State for Health on his visit to the Lister Hospital to announce the government’s backing for the £72 million investment for the latest stage of development at the hospital. This latest £70 million investment will build on the work of the staff and allow completion of another eleven projects. The largest of these are the new Emergency Department, a new ward block and a new Theatre & Endoscopy block all due for completion in 2013. “I am already looking forward to the official opening of the Maternity Unit, Surgicentre and multi-storey car park later this year.”, said Stephen McPartland. “Protecting and improving our local NHS is a key priority”, Stephen emphasised, “and I will continue working with unions, managers, staff, clinicians and patients to deliver the best healthcare possible for local people and our hospital is now on course to be the best in the UK”. Stephen McPartland MP visited the Stevenage Furniture Recycling Scheme ahead of their 25th anniversary serving the community in Stevenage. Stephen said, "The furniture scheme is run by local people to give direct help to others in need in Stevenage and I am glad to give my support. Having a nice home is an essential part of helping people build their lives and the quality of furniture available at such low prices is a testament to the generosity of local people." The Stevenage Furniture Recycling Scheme offers furniture for sale to the general public, with reductions so as to be affordable for those on low income. The furniture and large electrical items come from donations, and a collection and delivery service is provided. For more information contact www.stevenagefrs.org.uk. 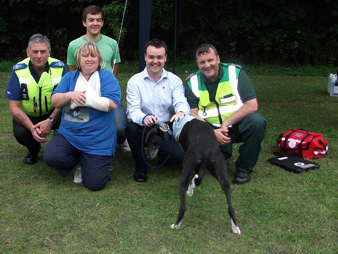 Stephen McPartland MP joined Stevenage DogWatch for their fun day at Fairlands Valley. Stevenage DogWatch was developed with Neighbourhood Watch and encourages dog walkers to keep their eyes and ears open and report suspicious incidents to the police. 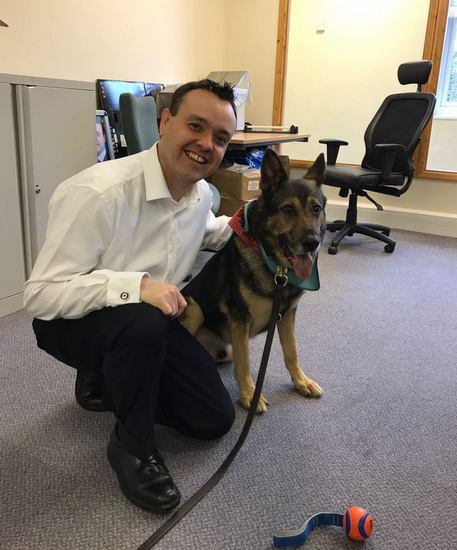 Stephen said, "I thoroughly enjoyed the day and am very pleased to be able to support Stevenage DogWatch. It is doing some great work and helps tackle crime by providing a great partnership between the police and the local community." Stevenage DogWatch has new members joining all the time. If you would like to know more please contact the coordinator Sarah Sheldrick on 07792 101893 or visit the website at http://www.stevenagedogwatch.org.